There's a heat wave in LA. Temps are passing 100 degrees and I've been living beside my fan in a sports bra trying to come up with a limit on the amount of cold La Croix waters I should consume. Heat exhausted is real and it's making me feel all sentimental, so here I'm overriding my fears to let out some feelings that I usually keep enclosed. I thank the heat and my yoga teacher for inspiring this sort of creativity. I used to have my own idea of love. I wrote my own stories on pages I tore from all of the notebooks you collected. 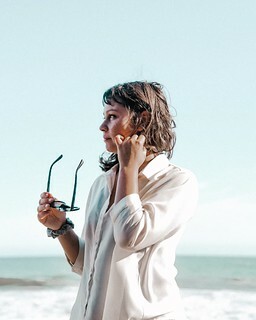 If only you took the time to write in them you just might have found all of my ideas of how a man should treat a woman and discovered all of the pieces that went missing from my heart as the years blew past us like the winds of our first hurricane. I admit that I spent some time being cynical. I always wanted one step ahead of what you offered me. And even though you offered me the world, I still craved the universe. I knew better than to flinch before your car hit the curb, because you were always so good at saving things before they crashed until things became me and I shattered recklessly into a million pieces. And I really believed that you could help put me back together until we realized that we aren't the same selves we believed ourselves to be. So I ran away lost looking for someone to pick up the pieces. Perhaps they're still scattered in the garden bed we once planted small seeds in, but you see, they're growing up into beautiful roses much like the ones I held in my hands that night you made a candle walkway and asked me to be your one and only. The only difference is these new roses planted in my heart never die and I've now learned that I am my own one and only. But every so often, when the thorn pricks at my veins, I bleed all of the words I should have said to you. And I just want you to know that even though you couldn't give me the universe, I am still grateful for the time I had the world at my fingertips. 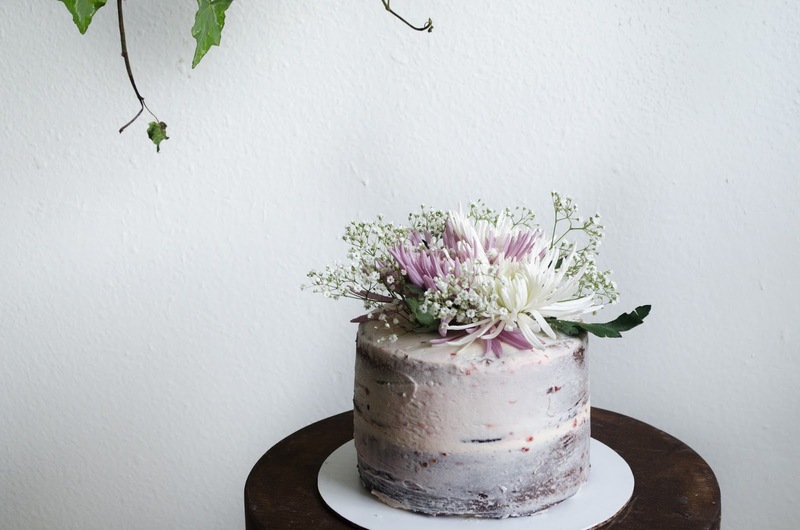 I've lately become obsessed with decorating cakes with minimal frosting and fresh flowers. 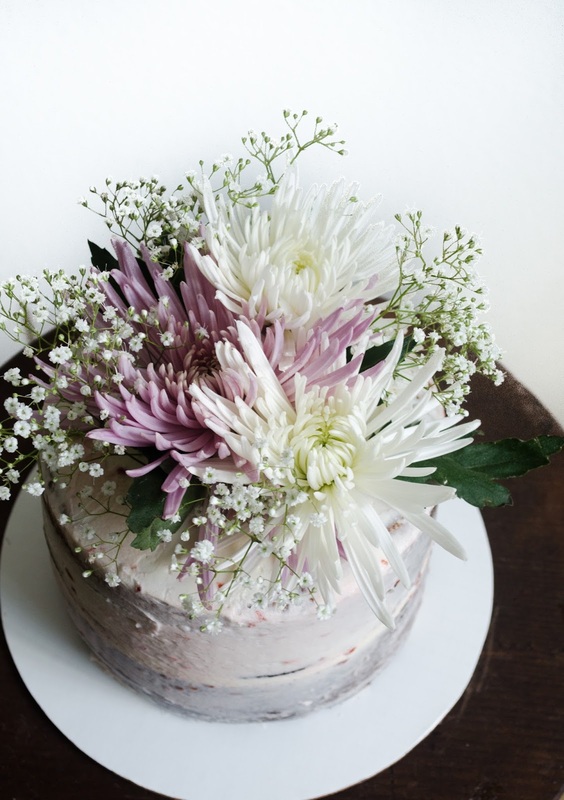 It's not the best way to showcase my decorating talent, if you will, but there's something so refreshing about building a bouquet into a cake. 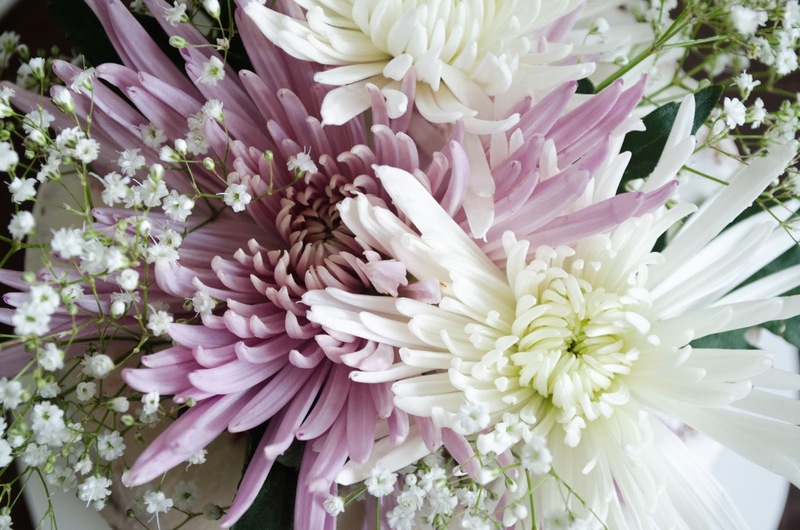 If you know someone who would appreciate a bouquet of flowers and a sweet treat to go with, I encourage you to follow this decoration style. 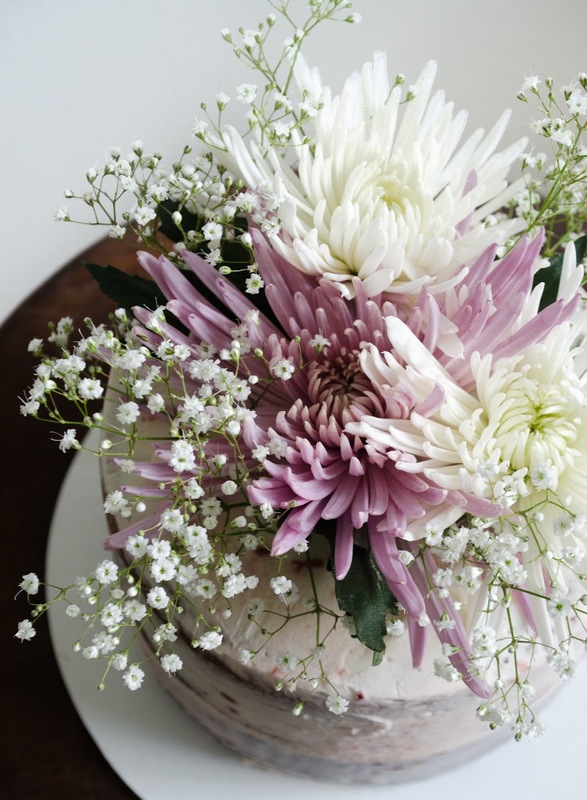 Additionally, if you think you deserve pretty flowers atop a cake, then get out there and pick your favorite bunches of flowers for a self-appreciation cake. If there's anything I've learned in the past two years, it's that you should show yourself the most love of all. Please bake/decorate this with good intentions and your whole heart (it tastes better when you do). In a medium bowl, sift the flour, baking powder, baking soda, and salt together. Stir. Add the eggs, one at a time, waiting until each egg is incorporated before adding the next. Then, mix in the vanilla bean. Add the flour and milk alternately, beginning and ending with the flour. Divide into all three cake pans and bake for 25-30 minutes or until a toothpick into the center comes out clean. Then, remove the cakes from the oven and let cool for 5 minutes before removing them from the pans. While the cakes are cooling, make the buttercream. Start by creaming the butter and salt using an electric mixer. Add the powdered sugar a little at a time until fully incorporated. Mix in the vanilla bean, raspberry jam, and heavy cream or milk. If you'd like a stronger raspberry flavor, feel free to add more jam to the buttercream. Once the cake layers are cooled, use a serrated knife to trim the tops to even them out. Then, fill each layer with buttercream and stack the cake. 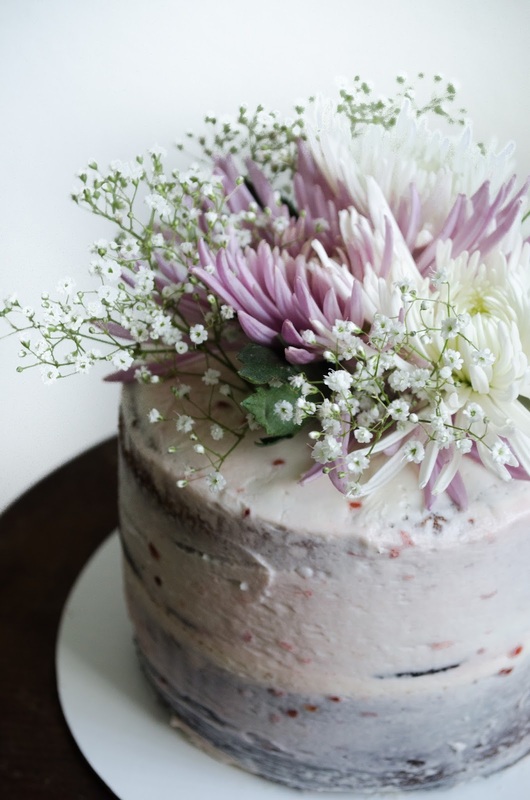 Use a cake spatula to cover the outside of the cake in frosting. Then, decorate the top with fresh flowers of your choice. 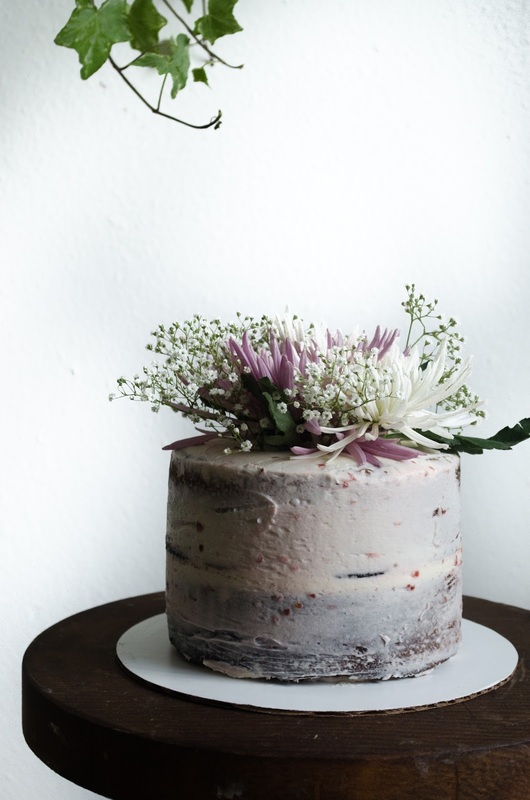 Give this pretty cake to someone you love, or better yet, tell yourself "I love you" and dig right in. * Vanilla bean is the way to go, but if you are making this quickly without time for a grocery-run, substitute 1 vanilla bean with 1 tablespoon of pure vanilla extract. * Chances are you don't own three cake pans, but you can bake each layer individually. This will take more time, but it's what I must do too!